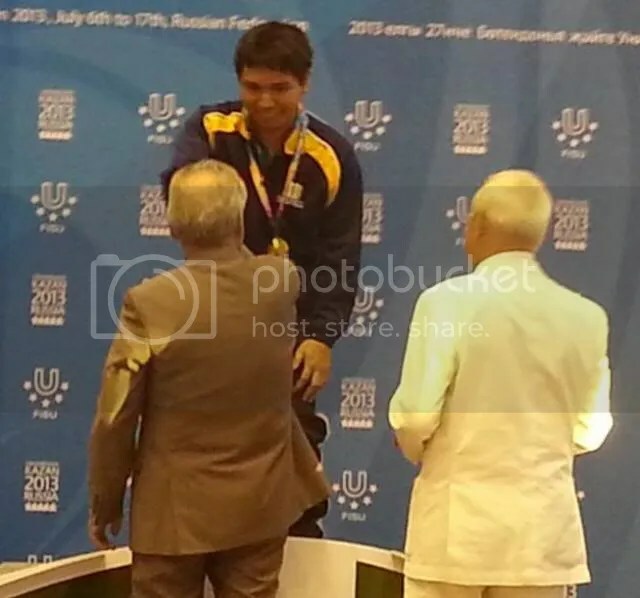 Chess Grandmaster Wesley So of Webster U, registered the Philippines’ 1st ever Gold Medal in the World University Games also known as the Universiade. 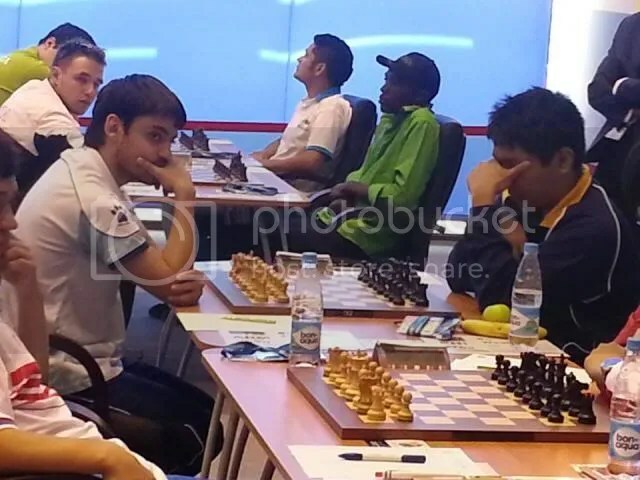 The 27th Summer Universiade held in Kazan, Russia from 6-17 July 2013 comprised of 27 sports event with chess that debuted at the 2011 Summer Universaide in Shenzhen as an optional sport, was participated this year by chess players from 46 countries. The chess tournaments were held in Kazan Equestrian Complex from 9-15 July. 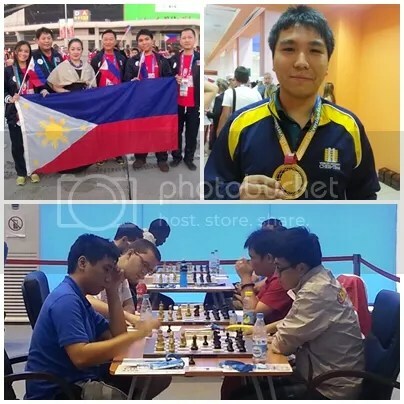 Seeded 3rd in the 9-round Swiss ‘Standard’ Men’s Chess event, Wesley So, scored 6.5/9 (4-wins, 5-draws, no-loss) and tied with 8 others, a 9-way tie for 1st place, with GMs Andriasian Zaven(ARM)2620, Li Chao B(CHN)2686, Ma Qun(CHN)2584, Matlakov Maxim(RUS)2665, Zhou Jianchao(CHI)2572, Alekseev Evgeny(RUS)2714, Tomczak Jacek(POL)2564 and Sjugirov Sanan(RUS)2647. 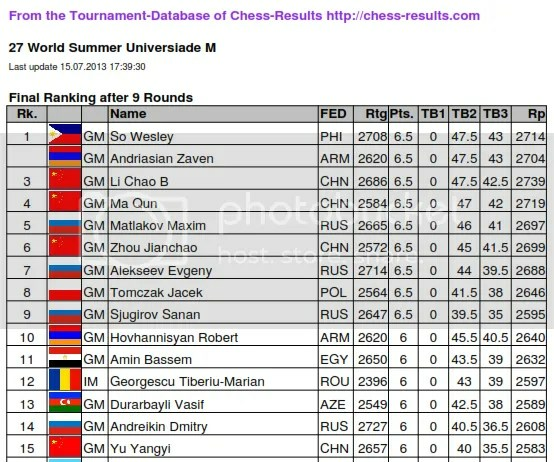 After the tie-break points have been computed, again, Wesley So tied for 1st place overall with GM Zaven Andriasian. An Armageddon playoff ensued to determine the Gold medalist where Wesley So was to play black (after losing the toss coin and Andriasian chose to play white). So forced the 2006 World Junior Chess Champion Zaven Andriasian to resign on the 51st move, an inevitable mate on the next move by black. Andriasian settled for Silver while Li Chao (the 2011 Gold medalist) took the Bronze. With this feat, Wesley So, now do have a FIDE ‘Standard’ Live rating of 2709.6 or a 2710 come August 2013 FIDE rating publication. He gained a +1.6 in ELO points. His Rating performance (Rp) of 2714 validates his hyper-GM (2700+) status. This also bring his streak to 63 games ‘No-Loss’ record in official FIDE rated ‘Standard’ Chess events. 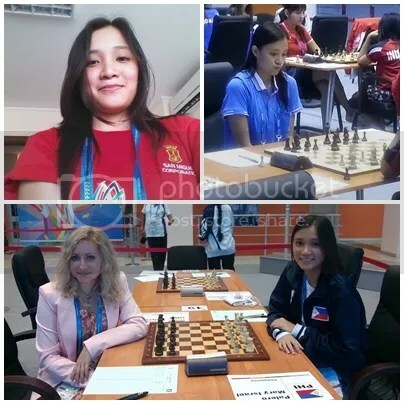 On the Women’s Chess event, the Philippines lone participant , Mary Israel Palero from Holy Cross of Davao College, scored 3.5/9 (2-wins, 3-draws & 4-loss), finished tied at 52nd-61st and placed 55th overall in the 71 players women’s division.